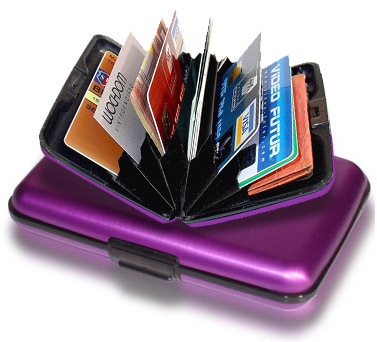 This card holder and coin purse is on the top of my 'gadget' wishlist. They're by a French company Ogon Designs, website is here. They are designed so that the aluminium case protects the magnetic strips from demagnetization and also from theft of personal data that can be stolen by radio scanners. May go back and try and find that shop again!